International Migrants Day was created by the UN on 4 December 2000. The day was created to celebrate all types of migration and 18 December was chosen as this was the date on which the UN adopted the International Convention on the Protection of the Rights of all Migrant Workers and Members of their Families. 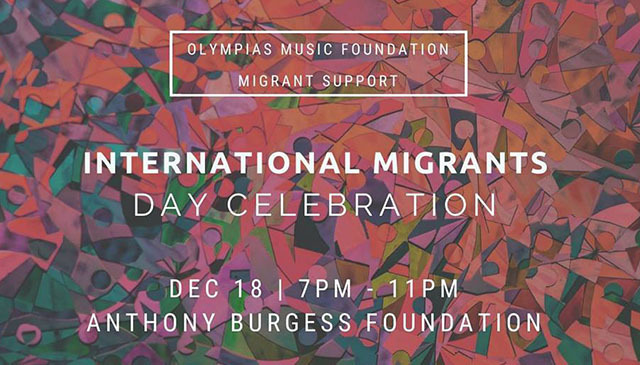 This year OMF will celebrate IMD18 alongside Manchester-based charity, Migrants Supporting Migrants. Join us for an evening of performances and talks, followed by drinks, nibbles and networking in the Anthony Burgess Foundation bar. Ticket price includes entry and a complimentary glass of wine or soft drink on arrival. All money raised will go towards Manchester charities, Migrant Support and Olympias Music Foundation and their work supporting migrants, refugees and asylum seekers in Manchester. With thanks to New Era Square for their generous sponsorship of this event.